I love it when I discover a new children’s book that warms my soul! 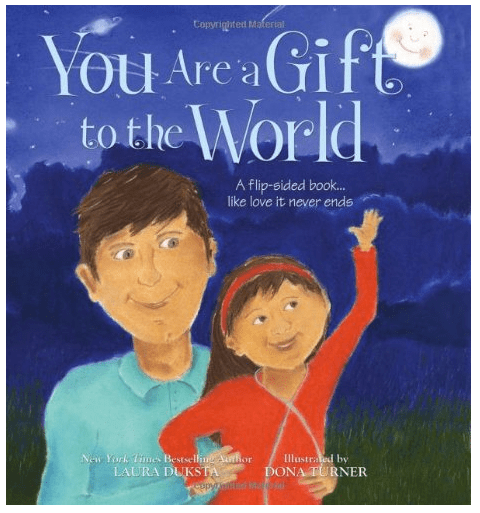 You Are a Gift to the World by Laura Duksta and illustrated by Dona Turner is just such a book. Coupled with it’s unique flip design, essentially giving you two books in one, the message of this book is one to be cherished. This book not only shows the deep love and appreciation of the natural world I value, it also expresses the deep love and appreciation I feel for my family. You are a gift to the world and the world is a gift to you! Laura Duksta lost all of her hair at age eleven. She was bullied, teased and humiliated throughout her teenage and college years. Even today, she remembers so clearly when someone at a party grabbed her wig and tossed it across a dance floor. As a result, Laura became introverted and depressed, and tried to fill the void caused by feeling like a misfit in unhealthy ways. It wasn’t until her thirtieth birthday, and after the idea for her first book, I Love You More, that she was finally able to accept herself, and her bald head. The idea of I Love You More came to Laura after she saw her sister dealing with issues of being a young mother, and her nephew as a victim of those difficulties. Laura self-published I Love You More and sold more than 50,000 copies. Sourcebooks then released the book and it went on to become a New York Times bestseller. Now, she is releasing a new book, You Are a Gift to the World (Sourcebooks Jabberwocky; April 19, 2011; $16.99; hardcover). Laura has become a champion for our children, writing books like I Love You More and You Are a Gift to the World to spread a message of love, appreciation and acceptance. I Love You More was written for her nephew, so that he—and all children—might know that no matter what’s going on in their lives or the world around them, they are loved. Only recently did Laura realize that writing I Love You More was also a healing experience for her. You Are a Gift to the World has a powerful message for children and adults about appreciating one another and the world around us. It also continues to generate the conversation of love amongst people everywhere. full of miracles just like you and me. to learn, to do, and to see. all start from tiny seeds. food and air your body needs. like a sun’s golden ray. The two books meet up into the middle with a beautiful image of Earth. This is such a sweet book you will enjoy sharing with your children in intimate moments of snuggling and reading! It is the perfect bedtime story to end your day in gratitude! Unfortunately, I could not find any information that leads me to believe this book is eco-friendly, but I love the message. It would be better if made from post consumer recycled paper! I have a daughter who just turned 9 and she likes reading inspirational books. She is kind and gentle. I’m going to buy this book for her. Thanks for sharing! The whole family will actually read this.